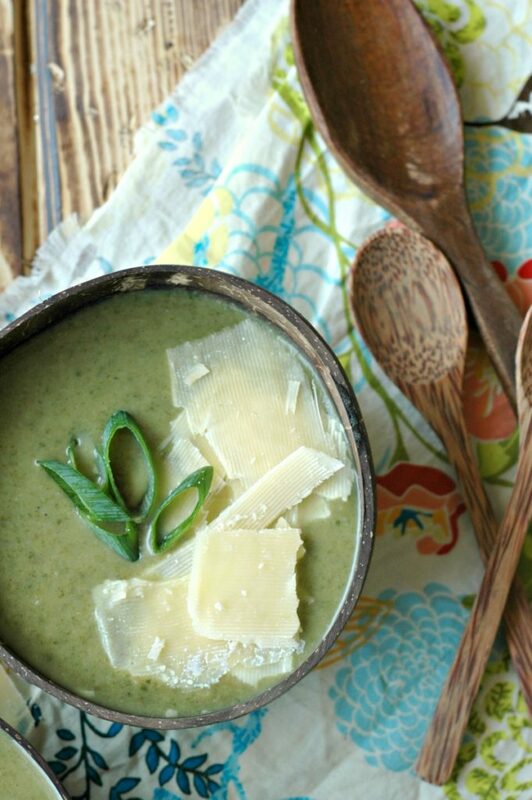 Spring onion soup made sweet and mild, perfect for sipping on a cool spring day! We bounce between winter coats and boots one weekend to hoodies and tennis shoes the next! 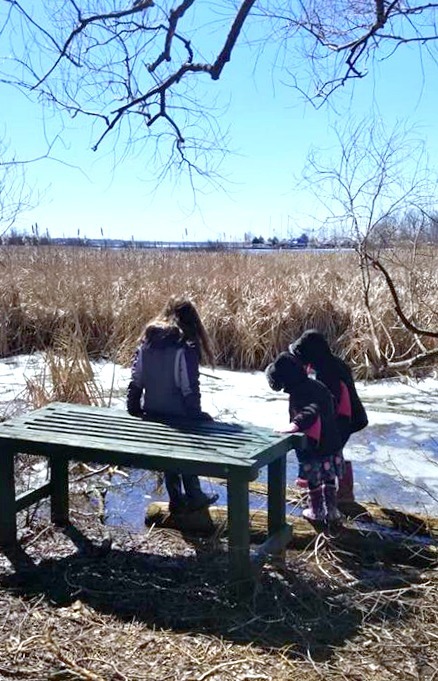 While we await a more consistent warmer spring air around these parts, I’ll share one more warming soup for the spring season. 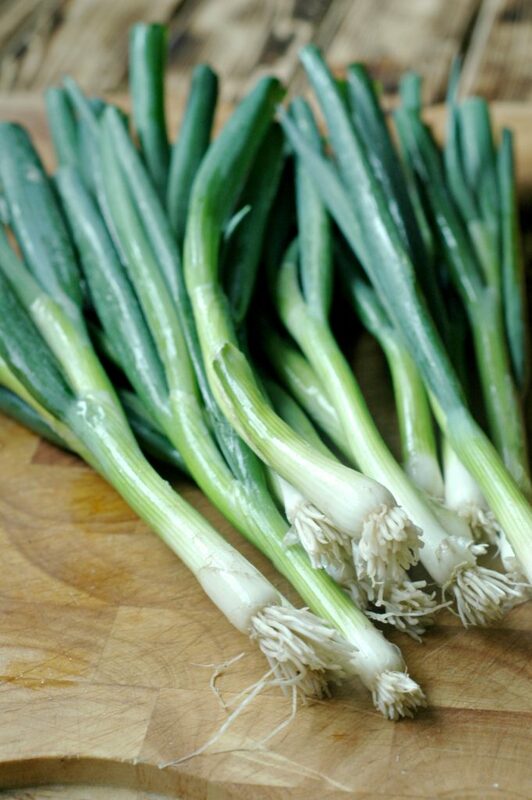 Spring onions (also called scallions) are just early onions, harvested before the onion bulb forms. You can find spring onions with a slightly larger bulb than what is pictured here if you can find them at farmer’s markets. This is more typical of what I can find organic in a grocery store around here, and either works great for this soup. Spring onions have more of a mild onion flavor, so we love eating them raw on salads in the summer, and it makes for a very sweet and mild onion soup – perfect for adults and kids alike. 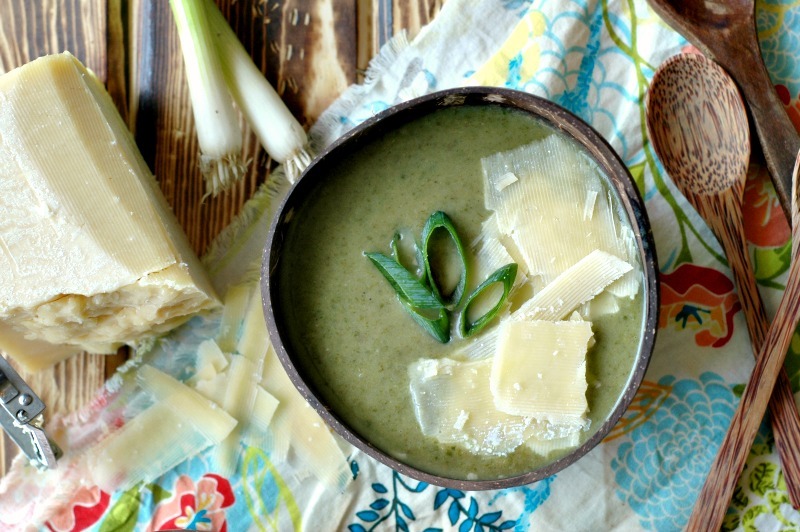 This spring onion soup couldn’t get any simpler as far as ingredients go. A simple potato crisped to perfection for flavor in sweet butter. A gentle and flavor enhancing saute, and a quick simmer with some fresh baby spinach for color and nutrients. 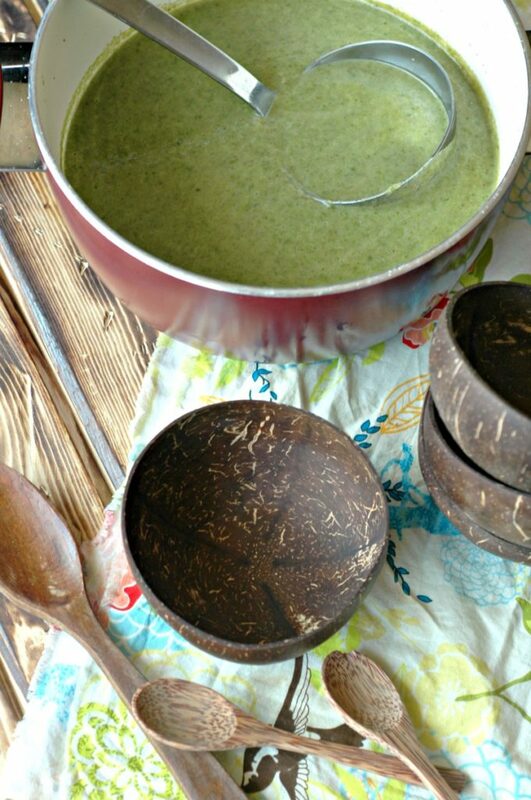 A blend through with an immersion blender or in your regular blender, and you have a super smooth, sip-able soup for your mug, or the kids’ tea cups that will warm your belly and nourish your body with spring at it’s best. But will the kids like it? If you have older kids that enjoy a French Onion soup, they will love this mild onion soup flavor. 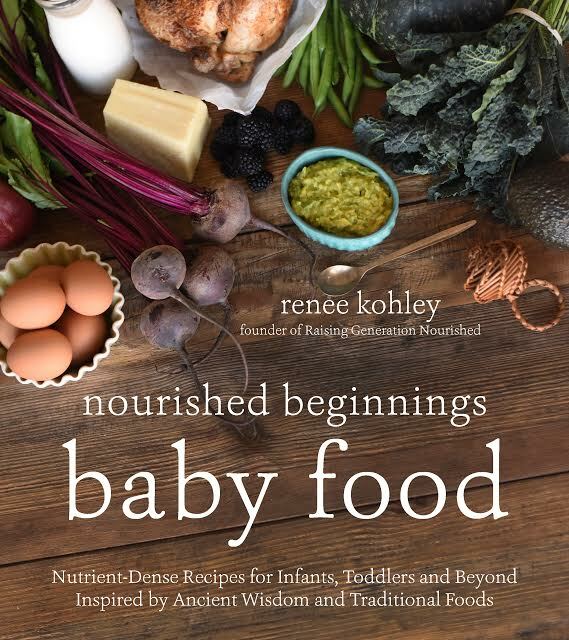 If you have little guys, say age 3 and under (even your 9 month old’s are in this category – perfectly safe to try if baby has started some bone broth and veggies just fine! ), I say ladle some of this gentle soup into a little tea cup with a straw and let them have at it. Introducing my babies to veggie soup purees from very young is, I’m almost positive, why they accept just about any new veggie soup puree I put in front of them. Including this one, which was a new soup for them. “New” foods can be a struggle for ages 3-6, and my 5 year old was not an exception. She did ask what it was, but knew that she just had to take a couple of “polite bites” to try the new food, and if she wasn’t a fan she could be done. As it turns, out she slurped down 2 small bowl-fulls and asked for it in her thermos for school. My oldest asked if there was any left the next morning for breakfast…like her momma, she is becoming, I tell ya! 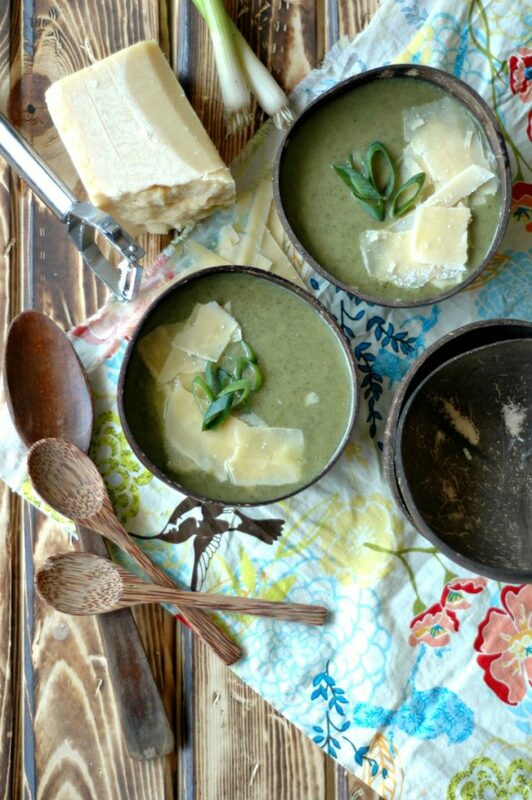 This beautiful and delicious spring onion soup has been a favorite breakfast of mine over the last month while I’ve perfected my ingredient ratios for you. Super hot in a mug with a side of hard boiled eggs and a muffin to be exact! Bone broth rich soup is a wonderful way to start the day, and truth be told, as the weather turns warmer, I’ll be swapping my breakfast soups for smoothies more often, so I’m savoring all I can of this beautiful season. SO many possibilities here! Our favorite so far has been the sweet and salty bite of shaved Parmesan or your favorite cheese on top. If you don’t tolerate cheese, you can add some nutritional yeast flakes during blending to add the cheesy bite. We also loved a swirl of tangy coconut yogurt. You could do sour cream if you wish too. A sprinkle of sunflower seeds gives great crunch as well. 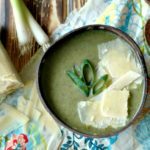 If you see an abundance of spring onions this season at your farmer’s market for those amazing in season prices, take advantage and double or triple this soup up. It freezes fantastic, and I even think the flavor enhances with time! Melt the butter in a soup pot over medium high heat, and add the potatoes with a big pinch of sea salt. 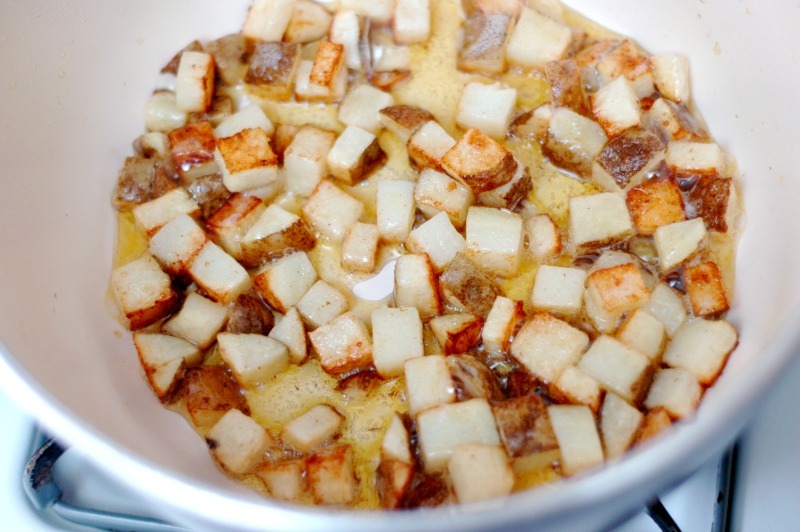 Cook until the potatoes start to slightly brown and crisp. This will take a good 5-10 minutes depending on how big you cubed your potatoes. Add the spring onion and garlic, stir, and cook over medium heat for a few minutes until fragrant and the spring onion wilts and the whites soften. Pour in the wine, scrape up any bits at the bottom of the soup pot, and lightly simmer for one minute. Add the bone broth and spinach and simmer for 5 minutes. Turn off the heat, blend the soup with your immersion blender or regular blender, and then sea salt and pepper the soup to your taste. Top the soup with your choice of cheese or a dollop of sour cream. Oh my goodness, this sounds delightful! Just perfect for those last chilly days of spring. Yes please!! What a delightful bowl of comfort food! LOVE the ingredients, of course.. and the colours! I would eat this for breakfast!! Thanks as always. Pinning for a moment when I can make this!! The soup looks so light and flavourful – perfect for Spring! 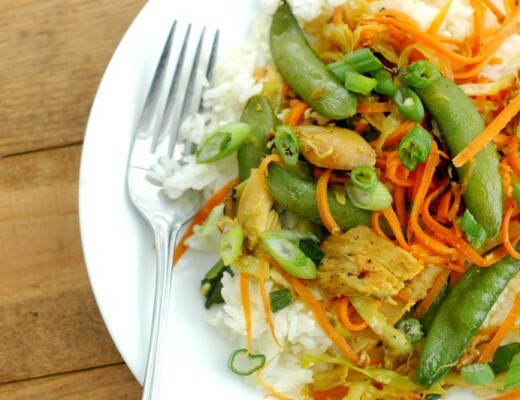 Creamy, flavorful, and whipped together quickly with stuff i already I had on hand, yum! I love everything about this! I love the potato in there for a few carbs, which my kids really need, the leafy greens, the parm on top (SO yum), the nourishing ingredients. So special and especially because it’s seasonal! This is so perfect for the chilly spring days we’ve been having, and I love how veggie packed it is too! I love how you added crispy potatoes in there for some flavour. This looks so nourishing yet light and not too heavy – perfect for any time of day! I’m definitely trying this when my farm share starts up again. Some weeks we get so many spring onions, and I have no idea what to do with all of them. Now I know!! 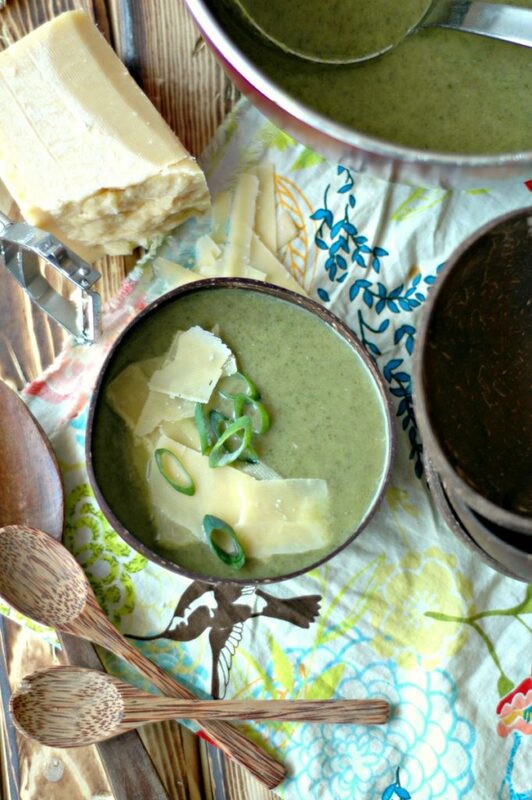 Never thought to make soup with spring onions, but what an amazing idea! It sound so nourishing and I love that you used bone broth for the base. Spring onion are my favorites and I always have them on hand! Can’t wait to try this recipe! Yum! 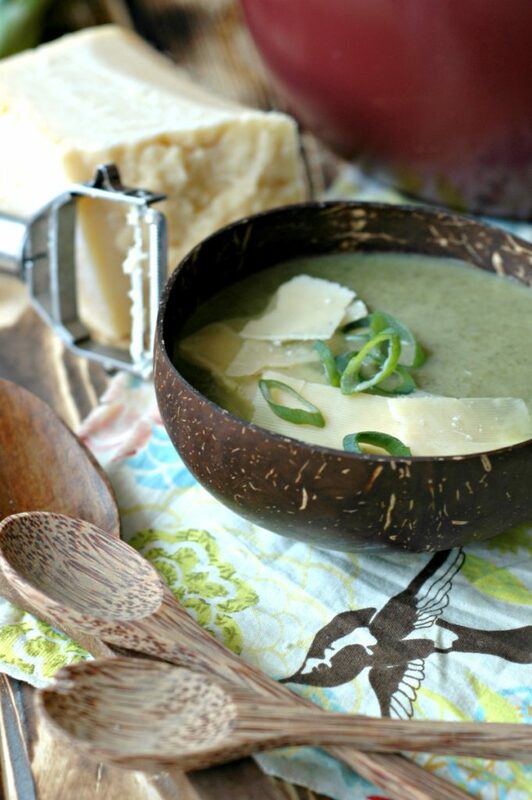 I add spring onion in so much of my cooking – this soup sounds right up my alley! Oh, this sounds delicious. It’s 10:03 am where I am and I would eat this for breakfast. Yummo!!! 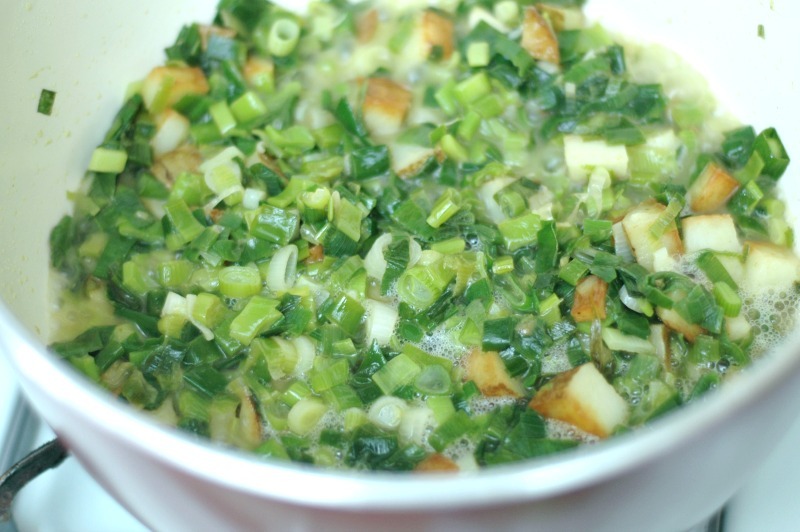 I am ALL ABOUT breakfast soup and it never occurred to me to make spring onions the dominant flavor. 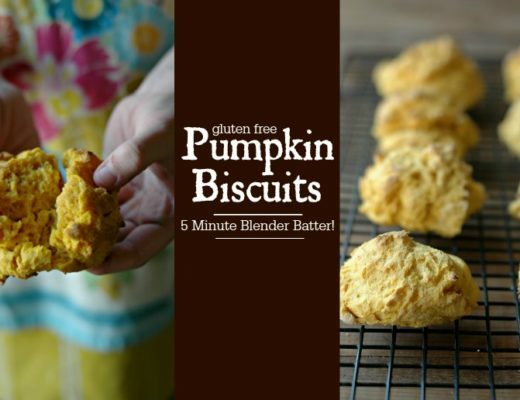 Totally making this for breakfast! I have never had break fast soup, but it sounds delicious. I would eat this soup any time of the day though!